After suffering the team’s worst loss of the season, the Dutchmen returned back to McGill field to honor its senior players. 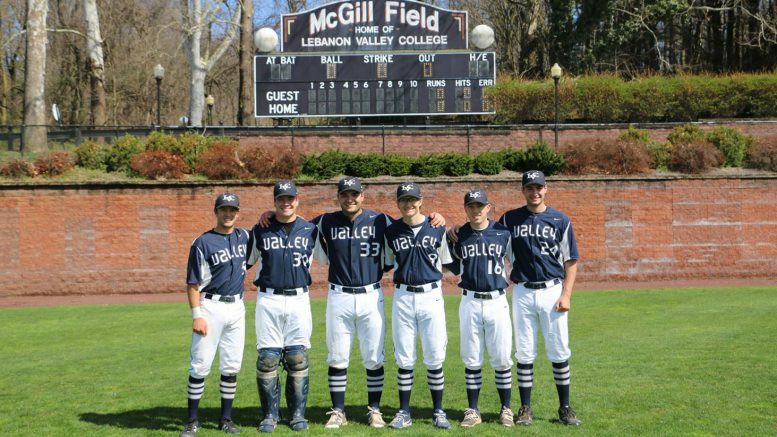 LVC honored the team’s six seniors this past Saturday: catcher Josh Willey, pitcher Jake Williams, first baseman Josh Marcelli, pitcher Ryan Showalter, outfielder Nick O’Shea and infielder Joey Wrabel. A day before, the Dutchmen fell to Widener University by a commanding score of 23-6. After winning only seven of the last 20 games, the team needed to get back on track. Starting on the mound for the LVC was Junior RHP, Brendan Ward. Ward has a record of 5-1 this season, with 36 innings pitched and 29 strikeouts. The Dutchmen trailed Widener the entire game, after the Pride scored three runs in the first inning. LVC only managed to score two runs in the first game and fell to Widener with a final score of 7-2. Determined to make something out of the day, the team looked to improve in the second game. Marcelli stared things off for the Dutchmen in the second inning after he hit a double down the right field line, moving junior third baseman, TJ Holdredge to third base. Next up was Nick O’Shea who earned himself an RBI with a single to the left side of the field. Then, freshman outfielder Mike Bulgia drove in Marcelli, on a deep ball to right-center field to bring the score to 2-0 in favor of LVC. Widener scored a lone run in the top of the seventh inning, but the Dutchmen held on to get the win on senior day. Kingsbury leads the team with 41.2 innings pitched and 39 strikeouts. He also has a record of 3-2 on the season with an ERA of 3.67. The Dutchmen moved to 14-15 on the season and will host The College of New Jersey, who is currently ranked eleventh in the nation, on Tuesday, April 16, at 3:30 p.m.